Sometimes we take for granted where we live and the foods we eat. Growing up in a typical Mexican-American household, my mom would make red chile enchiladas on a regular basis. We ate them so frequently that honestly I “could take them or leave them.” That was until I moved out of Los Angeles. In my early 20’s, I moved to the east coast to discover the scarcity of good quality Mexican restaurants. Every enchilada I ate tasted like something served from a drive-thru of a well-known national chain. It was at that time that I realized how much I loved and missed my mama’s homemade and spicy red chile enchiladas. In this recipe, we use the method where the tortilla is lightly fried then dipped in a warmed chile sauce, filled and rolled. If this is too much work, you can always make an enchilada casserole where you layer the tortillas in a baking dish similar to lasagna, adding the cheese, sauce and other fillings between the layers. Chicken or beef? A question waitresses ask when ordering enchiladas. I encourage you to push beyond the norm and create fillings that inspire. In this recipe, we worked with onions, garlic and mushrooms as a filling. Today, gourmet cooks are making enchiladas stuffed with spinach and kale, nopales, or other tasty mixtures. 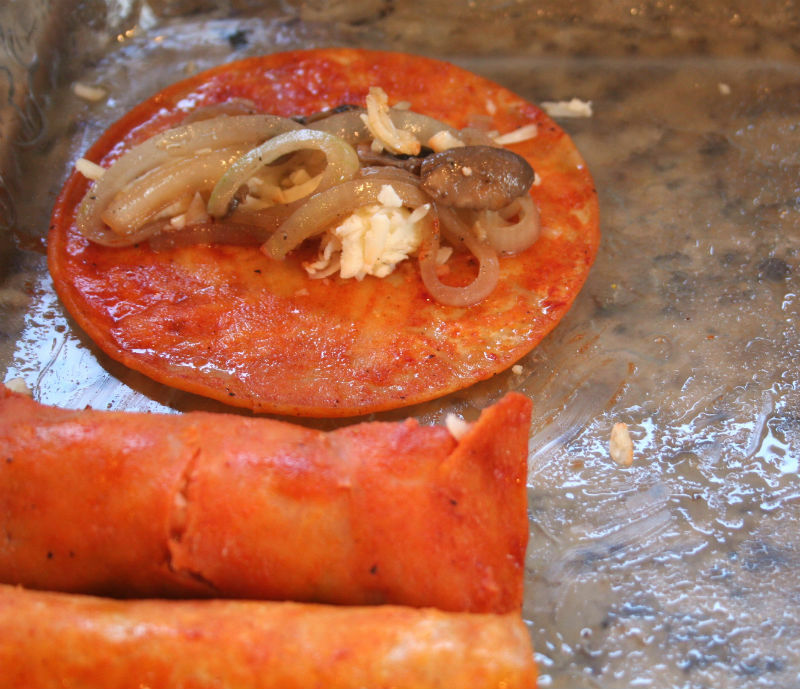 That’s the beauty of the enchilada, you can allow yourself the freedom to be creative and make them all your own. 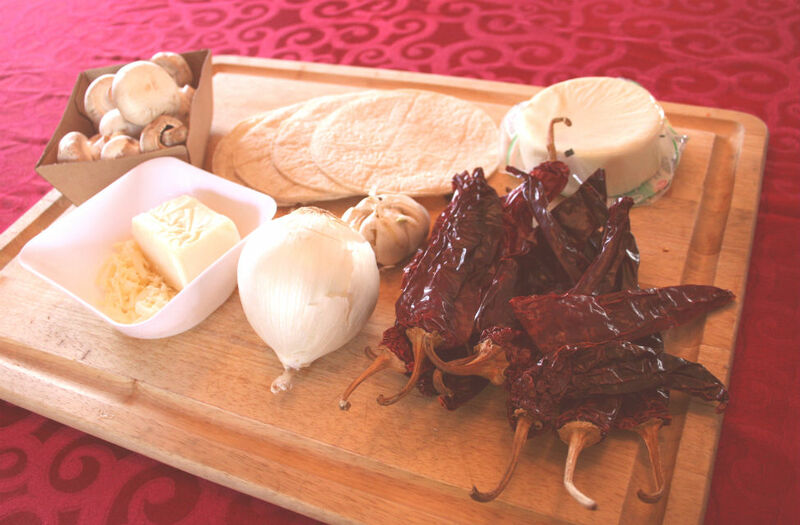 In a large stock pot, combine the guajillo peppers, garlic, and onion and cover with water. Bring to a boil for 20 minutes. Let stand for 10 minutes until the peppers are tender. With a slotted spoon, remove all the ingredients and place in a blender. Add about 2 cups of the water to the blender. Add the salt, cumin and oregano. Blend on high until mixture becomes a puree. 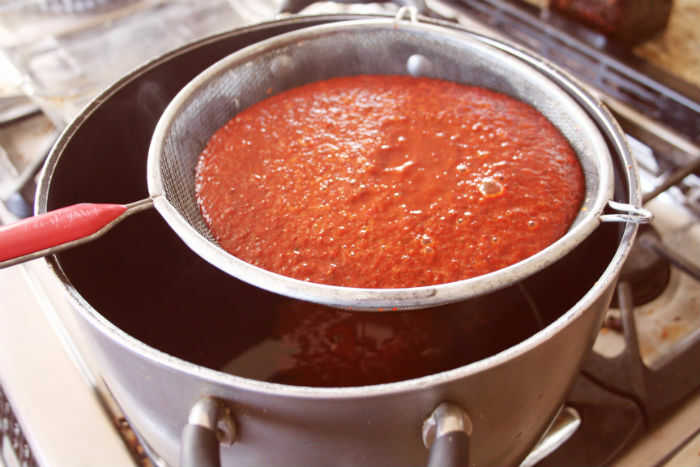 In a medium bowl, push the red chile sauce through a sieve. Discard any seeds or skins of the pepper. Makes about six cups of sauce. Save the red sauce in the bowl. Add the onions and mushrooms and saute for about three- to-five minutes until the onions are translucent. Add the garlic and cook for another five minutes. Transfer mushroom mixture to a medium size bowl and set aside to cool. Spray a casserole dish with non-stick cooking spray. Set aside. 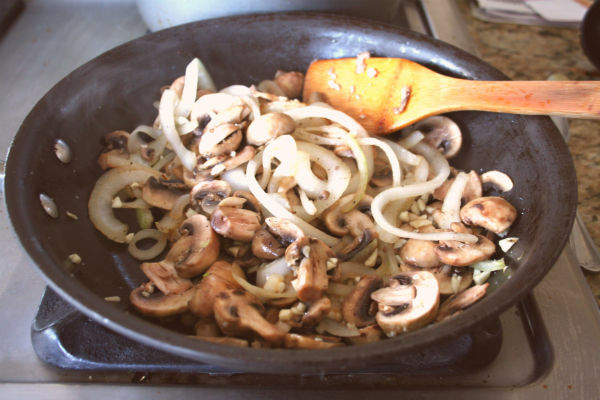 In a medium-sized skillet, add vegetable oil at medium heat. In another medium-sized skillet add the red chile sauce on medium heat. Allow sauce to warm, but be careful not to boil. Working one-by-one, add a corn tortilla to the hot oil, fry for about one minute. With tongs, remove the tortilla from the oil and dip into the warm red sauce. Remove the tortilla from the red sauce and place on the casserole dish. Add the mushroom/onion mixture (about two full tablespoons ) along with two tablespoons of cheese. Roll the tortilla and continue the process until your casserole dish is filled with stuffed enchiladas. Pour the remaining red chile sauce on top of the rolled enchiladas. Sprinkle with the Monterey Jack Cheese on top and place in oven for about 45 minutes. Remove from oven and sprinkle with the crumbled queso fresco. Optional: Sprinkle chopped green onions and chopped olives on top of the enchiladas. Serve the enchiladas with Mexican rice and beans. Sit down and enjoy every bite because there are people around the world who are missing this flavorful dish and think the ones served from a national fast food chain is what an enchilada tastes like — NOT!